The Battle of Polytopia is a turn based strategic adventure. It’s a game about ruling the world, fighting evil AI tribes, discovering new lands and mastering new technologies. Beat your friends in online battles and compete on the global high score list. Auto generated maps make each game a new experience, with unlimited replay value. Pick and choose among different tribes. Wander in the dark cold forests of Barduria, explore the steamy Kickoo jungles or claim the lush field of the Imperius empire. I just can’t get over how perfect this game is. It is a wonderfuly unexpected gem. The only thing that I could critique is the price(it’s too low). It’s mixture of simplicity and strategy are that of straight up brilliance. It’s a great city building game that’s free of the shackles of “freemium,” and every strategy fan owes it to themselves to give it a shot at some point. The battle of Polytopia is the first game from the indie game studio Midjiwan, based in Stockholm, Sweden. 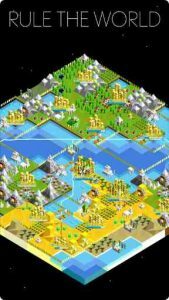 Being a huge fan of games like Civilisation and Master of Orion I was pleasantly surprised to come across Battle of Polytopia. Free to play with the first set of tribes, players can purchase additional tribes, each with their own specialty. Playing against more tribes also expands the map. Games are fast, from fifteen minutes when playing against a few tribes to longer than an hour when playing against all tribes. The tech tree is limited but well balanced, allowing for a wide variety of units and upgrades for your square depending on the square type, such as mountains and fields. Settlers do not exist, instead, land is conquered by taking over villages that are randomly scattered over the map. The fun starts once other tribes are discovered and the battle begins. There is no option for diplomacy however this game does not aim to be a competitor of advanced civ-like games but likes to keep things simple and quick. Instead diplomacy is based on how you score against other tribes and whether you are aggressive or defensive (note: on Crazy all tribes pretty much fight you regardless). All in all 5 stars, the only wait now is for the online multiplayer option.